With the Farmers Almanac prediction of a “hard” winter in our area this year, we thought it prudent to relay some tales from the blizzard of 2009. Following are some really good tips to make riding out the storm easier or maybe just a little fun! You wake up snug and warm under a down comforter. The wind is gusting, probably up to 20 knots, you think, based on the whistling sound, the rock of the boat, and the squeak of fenders against the side when you rock. It’s dark in here, darker than usual. You’ve slept in, as you do on Saturdays, and in this warm nest, you have no concept of time. As you awaken, the memory comes back to you—a weather forecast, a storm, a real whopper. The snow-covered port holes and hatches tell the tale. The blizzard had begun. Hundreds of liveaboard sailors in Chesapeake country woke up to this scene on December 19, 2009. By 10 a.m., it had snowed nine inches in Annapolis, and the steady dump of snow would go on all day and deep into the evening accumulating another foot. Freelance writer Cindy Wallach woke up in “what felt like a cave” on her St. Francis 44 catamaran with her husband Doug Vibbert and then five-year-old son Zach. She was thrilled that their makeshift tarp over the cockpit worked well enough that they could open the companionway door. The first step to escaping the cave is to shovel your way out of the cockpit “very carefully,” says Vibbert. “Gingerly,” notes his dockmate. Liveaboards use shovels—preferably plastic so as not to scrape the deck—or dustpans (and we heard one rumor of a “southern-belle-style” shovel act with a pewter serving tray). Some shovel the whole deck; others, such as a couple of the cruisers living at Annapolis City Dock this winter, only shovel a path out of the cockpit and let the sun do the work. A few noted that the difficulty arises when the path you’ve cleared freezes. Going into the icy drink, especially when you’re alone, “lifejacketless”, and lacking easy access to a swim ladder is beyond uncomfortable; it’s deadly. 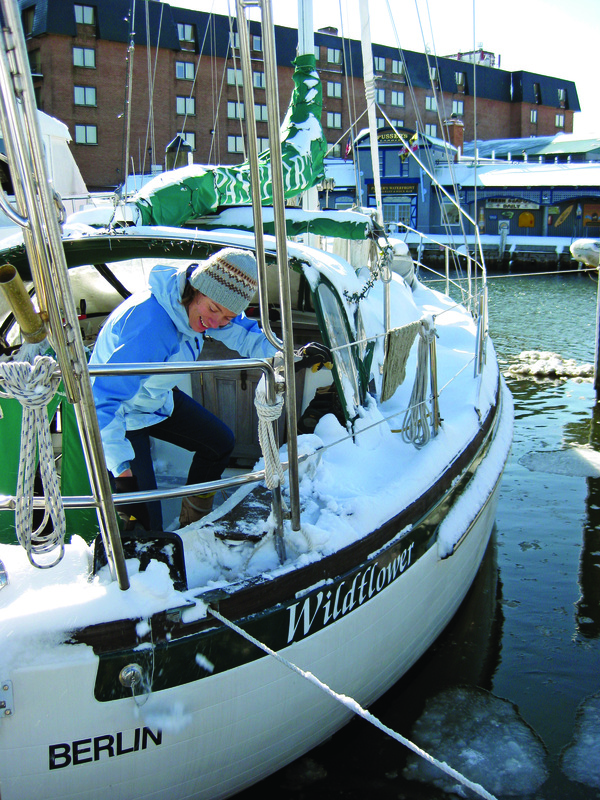 Some liveaboards at the Annapolis Landing Marina have an ingenious solution to the traction issue: YakTrax. These strappy contraptions of woven rubber and metal slip over your shoes, as old-fashioned roller skates or crampons would, and act as “snow tires for your feet,” according to Wallach, who is convinced that YakTrax should be as mandatory for winter dock safety as lifejackets and the buddy system. Once the decks and docks are shoveled and salted, and a few extra space heaters are in place, what’s left to do in a blizzard? “A lot of baking,” says Wallach, who admits that a full blizzard day at home in a cave with no natural light was making her “a little kooky.” She and her family filled their day melting chocolate, baking muffins and bread in the shape of a sun for the solstice, burning candles, and drinking tea, maybe with a dash of rum. Carrie Gentile, another writer and sailor who lived on a trawler with her boyfriend, cross-country skied through Eastport, made chocolate and peanut butter buckeyes, napped, and shared homemade soup and hot buttered rum on her neighbors boat in celebration of the storm. “I’m from Vermont, so I love the snow,” she says (she has since moved to upstate New York). With two big dogs to walk, Gentile is no stranger to slippery docks in foul weather. For traction in footwear, she’s partial to Salomon snow clogs. Tony Ireland, another liveaboard sailor and charter captain, says, “I thought Saturday was going to be a day of books and pay-per-view, but while I was at CVS buying milk, the guy in front of me in line was buying a long Santa hat and shared his plans to participate in the Speedo Run.” Ireland had to check out this quirky, humorous charity event, involving about 40 Santas in Speedos from various running (and drinking) clubs, who run up and down Annapolis’s Main Street to the cheers of the crowd, which was rather slim, as the blustery blizzard did not let up for a moment. Ireland enjoyed the spectacle and the pub crawl following the event with a bunch of other friendly neighbors (santaspeedorunannapolis.com). With the exception of a few of them noting how stepping off a boat to a skinny finger pier is daunting in snow, I tried and failed to get Ireland and the other liveaboards to give me negative nuggets about their life onboard, even during a blizzard. I asked, “Isn’t it tricky to shovel the slippery deck?” I pushed on, “Must have been a rough day… It’s got to be cold down there.” It’s not that bad, they tell me. You figure it out. Plug in more space heaters. Throw down some more salt. Bake cookies. Party with your slip mates. Even Wallach, who despises winter and is counting the days before she can visit family in Hawaii, had a happy blizzard weekend. If you’re looking for lighthearted company with someone who likes to talk about sailing, invite a liveaboard sailor to share hot toddies and stories by your fireplace one night this winter. Your hospitality will be greatly appreciated—and maybe reciprocated with a day sail come spring.